Tonight, at the final dress rehearsal of Don Pasquale over at Meany Hall, we’ll hear tenor Jason Slayden in the role of Ernesto. Jason, who made his mainstage debut in January in Attila, made a big splash last summer when he sang Rodolfo in Santa Fe. He speaks to us today about Ernesto, the not-so-heroic romantic lead he plays in Don Pasquale, and some of the lovely music he sings. So far this season you’ve sung a French hero (Werther) and an Italian one (Ernesto) for us. Do you find one or the other language, and/or way of being, more suited to your voice? Italian is a little more natural, as far as being able to stay true to your technique, because the vowels are simpler--they're either open or closed. Most people, when they’re learning to sing, start with Italian art songs. Italian has no nasal vowels. You’re always trying to maintain a steady stream of sound with your vowels. And in Italian, unlike French, you don’t have any guttural sounds. What about the nature of the hero's character? Is it easier for you to connect with Ernesto or with Werther? They’re different. Werther is a lot more emotional, a much more complex character. It let me go further into a darker place. Jason Slayden as Werther in last fall's YAP production, with Sarah Larsen as Charlotte. Is that your favorite kind of character? Not necessarily. I like to explore all elements of character, but Ernesto is fun because I get to be a little more goofy. Andrew Stenson, who shares the role of Ernesto with you, recently pointed out that tenors have to be the straight man in a comedy. Yes...Ernesto is very young and inexperienced, he's living off his uncle. But there are times where you can be a little more lively than with Werther, because of the nature of the comedy. 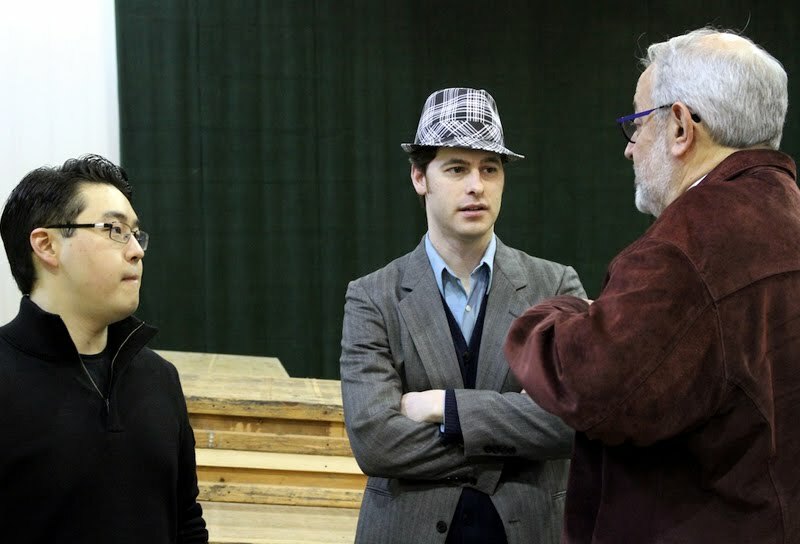 Andrew Stenson and Jason Slayden discuss the role of Ernesto with YAP director Peter Kazaras. There’s a great moment in the score where you laugh hysterically at how “Sofronia” treats Don Pasquale. Is it necessary to “sing” the laughter? I don’t sing it, I just laugh! It's true, Donizetti wrote 8th notes, but we’re not doing that moment metrically. In the plot, at that point, Don Pasquale wants something out of Norina and she shuts him down with “No!” and Ernesto finds it funny. For the first time since Ernesto has been disinherited, he’s seen Pasquale shut down. 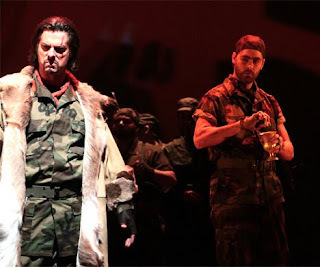 Attila (John Relyea) has no idea that his duplicitous slave Uldino (Jason Slayden) is poisoning his drink in Act Three of Attila . When you appeared on the mainstage as Uldino in Attila a couple of months ago, you told us about having to add complexity and backstory to what was in the libretto, to make the character make more sense. Have you done the same with Ernesto, or are you happy to present him as your standard, straightforward, sweet young lovestruck tenor hero? I’m trying to figure out whether Ernesto is completely naïve, living off his rich uncle, or if he’s maybe been around the block and is trying to settle down. You sang a few Tosti songs at a recent recital—you told us they were “tenor heaven.” What do you feel about the third act serenade you sing in this opera, “Com’è genile”? Absolutely. It’s supposed to be a folk song, an Italian song that already existed. 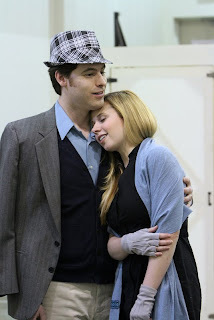 Jason Slayden and Lindsay Russell rehearse their Don Pasquale love duet. What’s your favorite moment in Don Pasquale? Do you sing patter in that ensemble? Just a very little bit. And it's really hard! I haven’t gotten it perfect yet. Why should people go to hear you in Don Pasquale? Don’t deceive your friends...don’t try to arrange a marriage without love. When you sing “Cercherò,” you’re going to leave her, go off to a life of wandering, because you wouldn’t want to inflict a life of poverty on her. Yes, she’s already poor. He knows there’s something out there better for her. —but it’s not. He’s feeling sorry for himself, for sure, but he thinks he’s doing something noble. That’s interesting. We were talking with William Burden about this, when he sang Orphée here a couple of weeks ago, and he said something I found fascinating: he said that grief is a selfish emotion. You know, in Orphée, he sits there grieving, alone, for the first half hour of the opera, and dramatically that’s a very self-involved, solipsistic scene. Finally he gets off his duff and says, “I’m going to do something about it,” when Amour comes in. Is the same thing true of “Cercherò”? Maybe. Is he really enlightened, at this point, or is he just feeling sorry for himself, being a little snot? That’s certainly what his uncle thinks! Tell us what you're doing next. 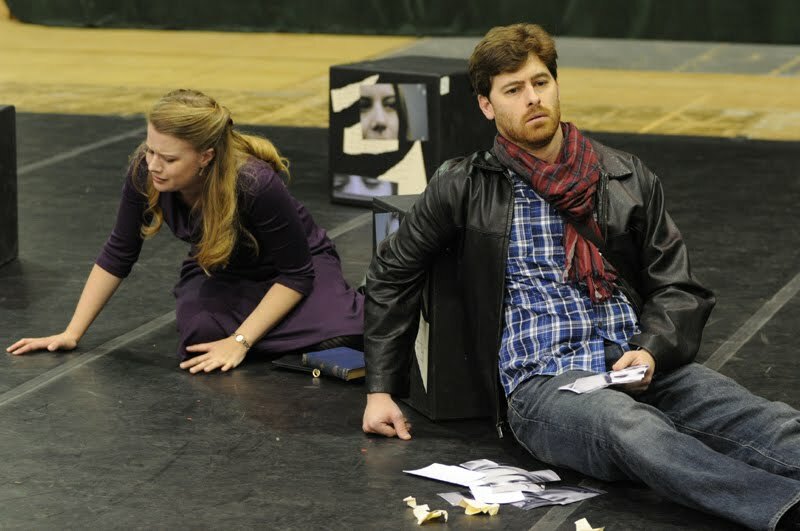 I’m going to Wolf Trap, where I'll sing my first Don Ottavio in Don Giovanni. Good for you! And we look forward to hearing you tonight.